There is a lot of fuss going on about a new kid in street. It is nothing other than the Income Declaration Scheme. Regular and honest taxpayers can safely ignore this scheme because they are responsible citizens and they pay their taxes regularly. Unfortunately, not everyone is so regular or even that responsible. The worst part, many people keep their incomes undeclared to dodge taxes. This isn’t a good idea. The income tax department eventually finds it out sooner or later. That’s when all hells break loose on those people who hide their income. 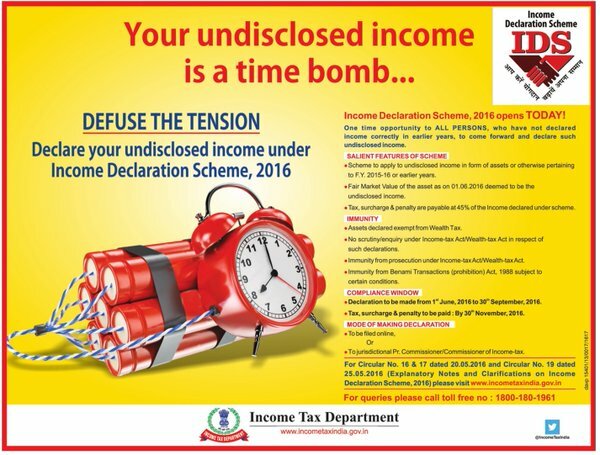 So, what precisely is Income Declaration Scheme? When the word scheme shows up, people generally think of some financial benefits. This new scheme called the Income Declaration Scheme is however exactly opposite. It does not give financial benefits. It rather focuses on taking away money. Sounds hideous? May be it does sound cruel but it is actually a noble move by government. The government actually gave an opportunity to such people who do not pay their taxes properly and keep their incomes hidden. Under this Income Declaration Scheme, people will get an opportunity to declare the income they had been hiding before. As end result will be that the government will levy taxes on such income and calculate all penalties and surcharges and take away the grand total. The total money that the government will take will be up to 45% of the income declared under this scheme. However, there is one big time benefits of this scheme. People who come forward and declare their income will no longer be prosecuted and they will get immunity. People who do not comply and ignore the Income Declaration Scheme will have to face the wrath of law once the income gets disclosed. When that happens, the ending won’t be happy. It may happen that not only the undeclared income is seized by the government but also, the person failing to declare his or her income may be prosecuted and jailed. That’s never a good thing, is it? An introduction of Income Declaration Scheme. Method for getting a proper details of income that has not been disclosed. Methods that can be used for declaring the undisclosed income using both online and offline modes. A quick table should help here. Give an opportunity to Indian citizens to declare their undisclosed income and pay the necessary taxes so that they can enjoy immunity and avoid prosecution. Who are not eligible for the scheme? Just like there is an eligibility condition, there is also a condition under which the scheme becomes inaccessible to some people even if they are Indians and they belong to any one of the categories mentioned above. The condition is that if a person is involved in any kind of legal action taken against him or her by the government either under the Income Tax Act or, as a matter of fact, any other Act (a clean list of which has been mentioned in the Income Declaration Scheme), he or she cannot opt for this scheme. That person needs to undergo the legal process and action will be taken against that person. The scheme is primarily meant for those who deliberately didn’t disclose their income in order to evade taxes. However, if person accidentally forgot to declare income and pay taxes, he or she can also opt for this scheme to avoid any future mishap. How can that be possible? Well it may happen that a person purchased an asset using the income he or she earned. That asset falls under the purview of capital tax. It may happen that the person didn’t intend to hide the asset but actually forgot it. So, this scheme will give the person to declare that asset and pay taxes, if any. Any income that has not been disclosed. Investments made in any kind of asset that has been purchased up to fiscal year 2015-2016 but has not been disclosed by the asset owner. A survey or search has already been conducted (excluding affected years). The money which a person wants to declare falls under the purview of 2015’s Black Money Act. Detainees under COFEPOSA cannot use this scheme. People who have received a notification under 1992’s Special Courts Act. People who have already been prosecuted under NDPS Act cannot opt for this scheme. People who have already been prosecuted under Prevention of Corruption Act cannot opt for this scheme. People who have been prosecuted under the Indian Penal Code for certain types of offences cannot opt for this scheme. How much is to be paid under IDS? 30% of the income that has not been disclosed will be taken as tax. 7.5% of the income that has not been disclosed will be taken as surcharge. 7.5% of the income that has not been disclosed will be taken as penalty. Are there any benefits of Income Declaration Scheme? The assets that will be declared under IDS will not attract any wealth tax. Once the declaration is made, the government will not make any inquiry or scrutiny under Wealth Tax and Income Tax Acts of India. Person declaring his or her income will no longer be prosecuted and will receive immunity under the Wealth Tax Act of India and Income Tax Act of India. A person who declares income / assets will not be prosecuted under what is known as Benami Transactions (Prohibition) Act provided the assets are transferred to real owner of such assets by the benamidar before September 30, 2017. What if one doesn’t comply with IDS? Tax will be anyway applied on such income that has not be disclosed or on assets that have been purchased using such income. The tax will be calculated up to fiscal year 2015-2016. The government will also deduct surcharges, penalties and interests as applicable. Worst part, government will take legal actions against the person who deliberately fails to comply with IDS. Such legal action can even lead to imprisonment and serious fines. What are the important dates for this scheme? Are they any specific forms that one needs to use? Yes there are special forms that one need to use. Actually, there is only one form to begin with. This is known as Form 1. This form can be accessed via the e-filing portal. Let us take a look at Form 1 and the forms that will follow. Form 1: Can be availed online from e-filing portal. It is a declaration form and should be filled up within September 30, 2016. The submission will also take place online. A digital signature will be required. In case the digital signature is ditched, one needs to opt for the electronic verification code. One can fill up the form directly at the online portal. If a person is not comfortable doing so, he or she needs to download the form. The form will be downloaded in what is known as XML format. The downloaded form can be printed and filled. The filled form has to be scanned and the scanned copy of the form has to be uploaded at the e-filing portal. After the Form 1 has been submitted, the Income Tax Department will acknowledge the same by issuing what is known as Form 2. Form 2: This is basically an acknowledgment form. There is nothing to be filled here. One simply needs to keep it with himself or herself. The form will be issued with 15 days from the date when the Form 1 was filled and submitted. After a person receives the Form 2, he or she will have to pay taxes on the newly disclosed income at the rate of 45%. Challan 286: The tax that one has to pay has to be paid using Challan 286. This is the challan that has been associated with IDS. No other challan will be accepted. Form 3: Once the payment has been made, a person needs to provide a proof that he or she has made the payment. This proof is to be provided using Form 3. One needs to fill up Form 3 and submit by November 30, 2016. Apart from filling up Form 3, the payment proof has to be attached too. Form 4: This will be granted by Pr. CIT/CIT. This is basically certificate of declaration. This certificate will be granted to the taxpayer with 15 days from the date when the payment was initiated. While using Income Declaration Scheme, it is very much important that a taxpayer should have the undisclosed income (and all assets purchased using that income) properly valued. The money paid as taxes under the IDS is completely non-refundable. Hence, if proper valuation is not done, one may end up paying more than what is actually due as per the rules. Year or years of income. The income head to which the income belongs. In case the undisclosed income has not been used for purchasing any asset and can be easily accessed, a person has to simply provide the amount. However, the problem will come when a person used that income to purchase some kind of asset. This is where valuation will be required. The asset will be valued at market price (known as Fair Market Value) as on June 1, 2016. The taxes will be calculated on the Fair Market Value of the asset and not on the actual purchase price of the asset. Quoted as well as unquoted securities and shares. Interests generated from investments in partnership firms. Any immovable property (residential or commercial). Art work, sculptures, paintings and drawings. Any other form of asset. The question is, how to evaluate Fair Market Value of assets? For precious stones, jewelery, bullion, art work, sculptures, paintings, drawings archeological collections and immovable property: The value of these assets will be calculated as on June 1, 2016. The actual purchase price of the assets will also be considered. The amount which is greater will be the FMV and will then be used for taxing. For financial assets: In case of these forms of assets, the acquisition cost will be considered and then the department will calculate the average of highest and lowest quoted price of the assets. The value which is higher (that is the acquisition cost or the average calculated) will be considered as Fair Market Value and will be taxed as per rules. It is really important that you get the valuation done by a valuer who is registered. The valuer will issue a proper report. The question is, how do you find such a valuer? In case you don’t know one, head over to this link. Towards the end of the page you will find a list of valuers. This list comes directly from the income tax department and hence, you can select any valuer. The charges mentioned above will not include the service tax. That will be levied separately. Do you have a Digital Signature? Go to e-filing portal here and login. Click on the tab called e-file. You will see an option which will read Upload Form 1. Click on it and the Java Utility should be downloaded. Now extract that utility. Right click for opening JAR file. This will give you a fillable form. Now fill up this form. Remember that all the fields in this form are mandatory. You cannot skip any. Once you have filled in all the fields, click of the option which reads, Generate XML. Once the XML is generated, you will have to upload it. Now you need to go back to e-file tab you saw first and the to Upload Form 1 option. From there, upload the XML file. If the upload is successful, you will see a message on the screen. You will also get an email from the IT department to your registered email ID. In form name section, give Form 1. Attach the digital signature file (in case you don’t have a digital signature, you can generate one. In the upload page you will see an option of DSC utility. You can download that utility and use the step-by-step instruction you see on the screen to generate a valid e-signature file. One you create the file, simply attach it to the given field. Once Form 1 has been submitted, you don’t have to do anything until the income tax department issues the acknowledgment form which is known as Form 2. This will not be issued immediately. It may take 15 day from the last day of month in which Form 1 was submitted. So, you have to wait. Assuming that you have received Form 2 (i.e. acknowledgment), you will have time until November 30, 2016 to pay the taxes. For this, you will need to use the Fair Market Value of the undisclosed income or assets that you have purchased using that income. You need to pay 45% of the income as income tax / wealth tax. For this, you will have to use Challan 286. You cannot use any other challan for this purpose. Once you have paid the taxes, you will have to now inform the income tax department that you have been a responsible citizen and you have paid the taxes. For this, you have to use what is known as Form 3. This form can again be accessed from e-filing portal. However, you need to remember that you have to pay everything that is due. This also involves the Krishi Kalyan Cess. If you are not paying that cess, the tax payment is incomplete and it will be considered a violation or misinterpretation. Hence, pay everything using Challan 286 and then give all the details in Form 3. Once you fill in Form 3 and submit the same, wait until you receive the acknowledgment or certificate of declaration. This certificate in known as Form 4. You won’t get Form 4 immediately. It may take up to 15 days to receive the certificate from the date on which you informed the income tax department that you have paid the taxes and uploaded the proof of such payment.